Adonis | Send Down the Basket! 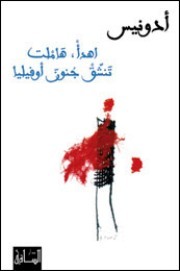 The poem is titled (slightly less decorously than the collection as a whole) “Calm down Hamlet, inhale Ophelia’s smell.” It was written in January 2006 (before the most recent Lebanon war, which he also writes about). On a very cursory first reading, not quite sure what it has to do with Hamlet (and it does not seem to be Adonis’ best work, not that I am any kind of expert).